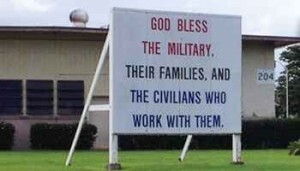 KANEOHE, Hawaii — A Marine Corps base in Hawaii is refusing to relocate or remove a sign that asks God’s blessing on the Armed Forces following receipt of a complaint from a group that seeks to separate God from the military. As previously reported, the Military Religious Freedom Foundation (MRFF) sent an email last month to Col. Sean Killeen, the commanding officer of Marine Corps Base Hawaii, to take issue with a sign near the marina that reads, “God bless the military, their families, and the civilians who work with them.” It was reportedly erected following the September 11th attack of 2001. Blake Page of MRFF asserted that the sign is a violation of the Establishment Clause of the U.S. Constitution, which reads, “Congress shall make no law respecting the establishment of religion or prohibiting the free exercise thereof.” He demanded that the sign either be moved to the chapel or removed altogether. “This sign is a brazen violation of the No Establishment clause of the Constitution, as it sends the clear message that your installation gives preference to those who hold religious beliefs over those who do not, and those who prefer a monotheistic, intervening God over other deities or theologies,” Blake wrote in the email to Killeen. But the religious liberties group Alliance Defending Freedom (ADF) also sent Killeen an email, asserting that MRFF’s demands were unconstitutional. “As it stands, the sign is not grounds for an Establishment Clause violation. However, removal of the sign would certainly be in violation of the Establishment Clause, showing preference for no religion over religion,” Director of Military Affairs Daniel Briggs wrote. accompanying each National Day of Prayer,” he continued. After deliberating the matter, Killeen sent a reply to MRFF on Friday refusing to relocate or remove the sign.